Diversification is incredibly important with all types of investing. Whether it be over various asset classes or markets, we believe geographic diversification is an important element to consider. We have several options for investors who would like to invest outside of the United States. In these investments several investors pull their funds together and partner with an experienced manager to purchase a property outside of the United States. This process can be very complicated and expensive, which is why it is incredibly important to partner with an experienced manager. 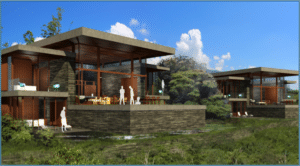 We’ve partnered with an experienced developer to build a sustainable community and retreat center on 800 acres just an hour outside of San Jose, Costa Rica. The vision is to create a unique spa/retreat center, to build a community of ex-pats looking for a more peaceful, relaxed, healthy way of life and to grow organic food for the community and for export. The land has already been entitled for a resort community, and a highly successful spa developer is on board. We are also working with one of the leading green architects in the United States who is known for developing Net Zero buildings. Phase 1 of this project has already wrapped up and we are moving on to Phase 2 to develop the residences. Are you interested in investing in an international project?